La Generación Z ahora está en el umbral de la edad adulta por lo que es cada vez más pertinente que los expertos en marketing se adapten a los valores y actitudes de este grupo. •¿Cuáles son sus características, deseos, gustos y disgustos? •¿Cómo quieren interactuar con las marcas? 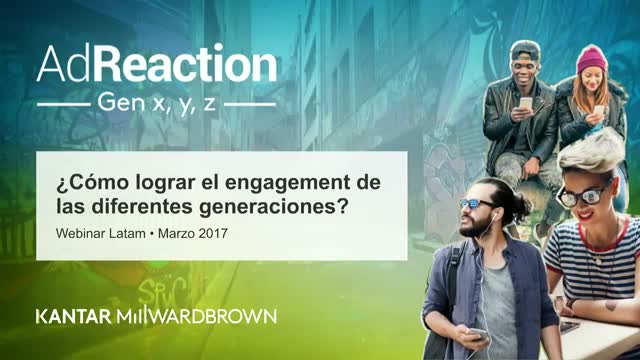 •¿En qué se diferencian sus actitudes y comportamientos hacia los medios de las de los Millennials (Generación Y) y la Generación X? How do you stand out from the crowd? Brands able to draw on established cues imprinted in the minds of consumers, have a ready-made advantage when it comes to influencing decision making. Those in possession of meaningful slogans, logos, colours, designs, packaging or celebrity endorsements, may activate them at key moments to fire relevant associations and memories. But what is the true value of a clear Brand Imprint? Where should brands focus their efforts, and how can they best ingrain and own them? Join our webinar 'Building an Imprint for success' with Martin Guerrieria, Global BrandZ Research Director, to uncover the answers to these questions with learnings and case studies from our proprietary neuro-based research in combination with the power of the BrandZ database. Quali caratteristiche contraddistinguono i Brand di successo? Segui il webinar. Analizzeremo i Brand più in salute, evidenziando gli elementi strategici che hanno fatto di questi Brand, dei Brand di Valore. BrandZ, lo studio internazionale di Kantar Millward Brown e WPP, approda per la prima volta nel nostro Paese e individua le 30 marche italiane di maggior successo in Italia e nel mondo. Unico nel suo genere, combina le opinioni dei consumatori con i risultati finanziari*, offrendo alle marche gli strumenti necessari per misurare, gestire e proteggere il loro principale valore intangibile: il Brand. Felipe Ramírez, Chief Solutions Officer de Kantar nos compartirá los datos de nuestro estudio más reciente de AdReaction: El Arte de la integración, que identifica las características clave para tener una campaña de marketing exitosa. Nuestros expertos discutirán los retos a los que los mercadólogos se enfrentan al día de hoy y los factores clave para maximizar las estrategias a lo largo de los diferentes canales y crear campañas multicanal que impulsen el crecimiento de la marca. © Kantar Millward Brown. All rights reserved. Join our leading media and creative development experts to learn more about our global study, AdReaction: The art of integration, which identifies the key characteristics of successful multichannel marketing campaigns. Our experts will discuss key challenges marketers face today and outline success factors to help you maximise synergies across channels, and develop multichannel campaigns that drive brand growth. Por décimo año, Kantar Millward Brown se complace en anunciar el lanzamiento del reporte Media & Digital Predictions 2018. Este reporte anual reúne a nuestros expertos en Media & Digital de todo el mundo para analizar las tendencias y predecir el impacto que tendrán en nuestra industria. 2018 apunta a ser otro año de mucha actividad para los especialistas en Marketing, conoce lo que implican esos retos y cómo enfrentarlos. 68% of Chinese consumers questioned by Kantar in December 2017 across Tier 1 to 3 Cities in China stated that they expect to spend more money in 2018 on achieving their Health & Wellness goals than they did in 2017. This webinar will share the findings from our study and discuss the strategies and tactics that brands can employ to ensure that they achieve more than their fair share of this increased spending. If you want to understand how to tap into this trend in your offline and on-line retail strategy, in your digital media and Key Opinion Leader Strategy including Medical Professionals, or in your brand positioning, then the insights and case studies in this webinar will be highly valuable for you, your marketers and product innovators. The age of 24/7 access to data has changed the world of brand tracking and marketers are looking for clarity on which metrics to measure. Focusing on fast access to the metrics that matter is the smart approach that will translate into brand growth. Join Nigel and Claire’s Brighttalk webinar to learn 5 principles to drive brand growth. La tecnología está transformando nuestra sociedad pero trae consigo varios retos. Abundan las noticias falsas, hay un crecimiento del uso de chatbots y una preocupación por la seguridad de los datos. En ese entorno ¿cómo las marcas pueden construir y mantener la confianza de los consumidores? Participa el próximo 16 de noviembre en el webinar de Connected Life, Hidden dangers: Trust in a Connected World. - ¿La conectividad está mejorando las relaciones con los clientes? - ¿Qué impacto tienen los chatbot en el servicio al clientes? - ¿Cómo pueden generar las marcas nuevas oportunidades de eCommerce al hacer frente a los desafíos de la pérdida de confianza? Technology is shaping society but is it making us uncomfortable? From connected devices, to chatbots, how can brands build and maintain trust in this rapidly-evolving world? • Is connectivity improving or eroding customer relationships? • When it comes to personal data, are we on the losing end of an unfair exchange, and what can businesses do to rebuild trust? • How is a world of self-serving or fake information eroding consumer trust in brand messages? For Financial Services organizations, the stakes around trust have never been higher than they are today, with trust-breaching incidents having far reaching consequences. High-profile data leaks, and the boom in connected devices monitoring our behavior, has created serious suspicion around how consumer data is being held. This presents a challenge both for consumers, who want to trust their financial institutions; and in turn for financial institutions to who need trust to retain customers and grow their business. It is crucial therefore for Financial Services organizations to view this increasing scrutiny as an early warning to maintain maximum transparency, and ensure the data they hold translates clearly into experiences that genuinely benefit their customers. - Is connectivity improving or eroding customer relationships? - When it comes to personal data, are customers really on the losing end of an unfair exchange, and what can businesses do to rebuild trust? - How is a world of self-serving or fake information eroding consumer trust in brand messages? Don’t miss a first look at the first annual ranking of the BrandZ™ Top 50 Most Valuable UK Brands on 1 November. It will reveal the UK’s most successful brands, analyse their strengths, and identify the key forces driving growth. At Kantar, we’re passionate about helping clients grow brands. We’re experts in advertising, marketing, communications, media, digital and brand equity research, and we work with 90% of the world’s leading brands. Through this channel, we will share insight-led content focusing on brand strategy, creative development, channel optimisation and brand performance.